GYS Smartmig 3P 3 in 1 Single Phase MIG Welding Machine Call for Price! 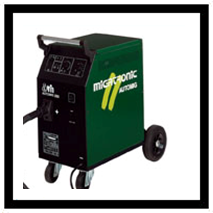 Lorch M-Pro 170 BasicPlus MIG-MAG Compact Welding Machine Call for Price! Lorch MicorMIG 300 BasicPlus Gas Cooled Call for Price! Lorch S3 Mobile SpeedPulse MIG-MAG Machine, Watercooler, Trolley Call for Price!